All in the Cards – Tell my story. 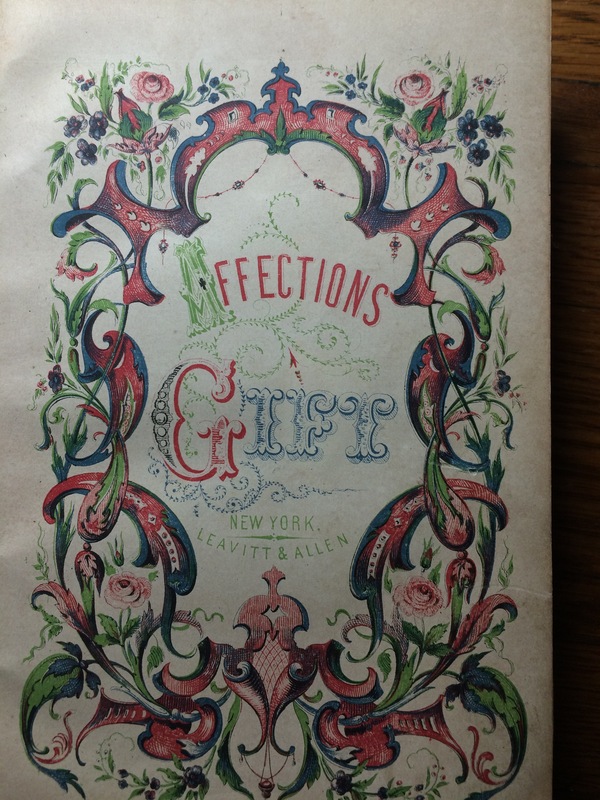 Last week, NPR’s History Department had a great story about flirtation cards. Ever hear of them? The fellow who had to use flirtation cards to meet eligible young ladies strikes me as having been a little desperate, you know? The young man may not have been invited to dances or soirees, or had an opportunity that often to meet proper young ladies. I know that Emmett was included in many social functions and gatherings; the mothers of Pensacola and Marianna society were the ones who issued these invitations, by the way. Emmett was considered quite eligible. He wasn’t hurting for invitations. Our friend CHB Floyd also once described Emmett as ‘besieged’ yet unconquered by young women who hoped to ‘catch’ him for a husband. I doubt Emmett had a need for flirtation cards. But, I can see his caddish (and very much married) older brother Cephas using them on occasion. Ceph wouldn’t let something like being married keep him off the dating scene. But that’s a story for another day. Speaking of cards, my dad recently sent me a book that belonged to my mother. That’s mother-of-pearl on the cover, which is a hard black material. It isn’t leather, and it isn’t fabric on the cover. Purchased by my mom in 1970. 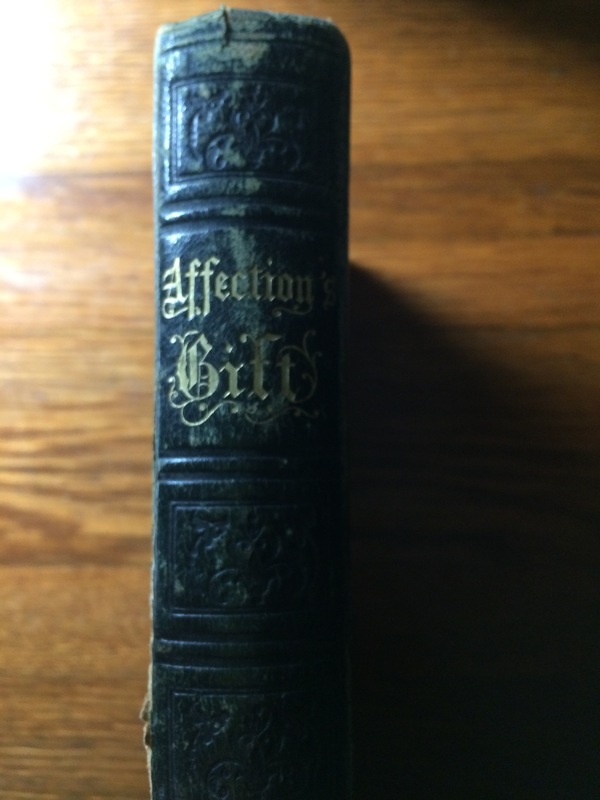 “Affection’s Gift.” It is gold leaf on the cover. Here’s the story of this book. When I was six years old, I lived in Vicksburg, Mississippi. My mom liked to go to estate sales all the time, and I went with her to this particular sale. She bought a brass floor lamp for $5 and this book, for $1. I remember that she liked the book very much, and she let me carry it home (we walked to the estate sale, which was in our neighborhood). Going to this sale was a big deal, because we did not have a lot of money when I was growing up. I remember my dad gave her hell about spending $5 for a brass floor lamp and “some old book.” She had the last laugh as the lamp turned out to be worth more than $200 and served up hot crow to my dad for about a week thereafter. The title page. 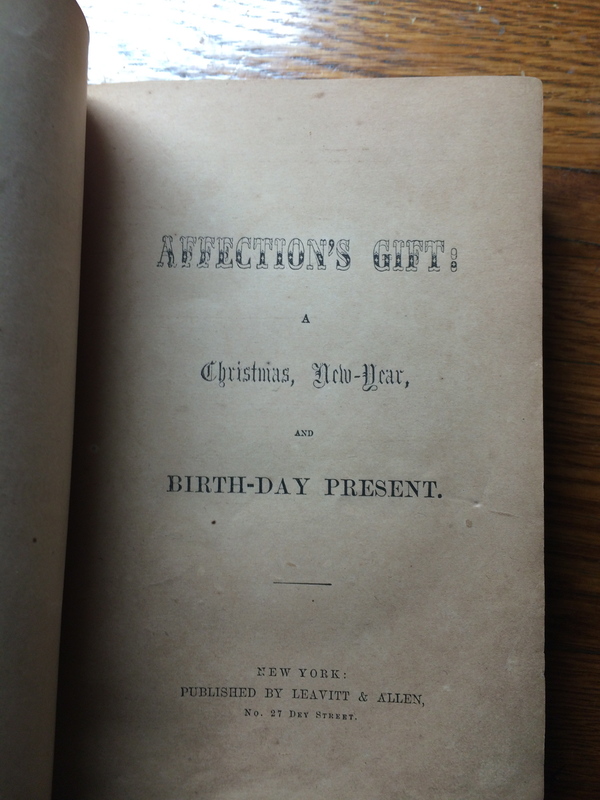 There is no date in this edition, but I looked it up, and there were different versions of this book produced between 1838 and 1858. 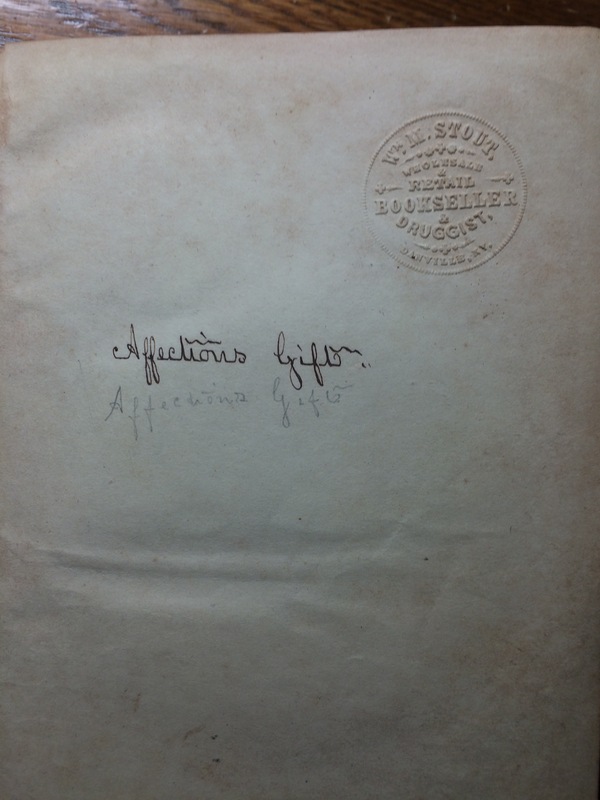 The best estimate for this particular book is 1853. Notice the drugstore stamp at the upper right, where (presumably) it was purchased. I like also how someone practiced writing the name of the book on this page. No date, no author given, but I dug around and discovered the author was a Mrs. John Sandford, AKA Elizabeth Poole Sandford. Someone has created a blog for her, too! Check it out here. Here’s the back of the book. The central inlay is not ceramic, but it seems to be an enameled wood, perhaps? I’m not sure. It is in great shape for something that is about 160 years old. This book is all about the ‘proper sphere of woman’, pre-suffrage. I tried reading it a few times as a kid, then a teenager, and found the text too irritating. (If you want to actually read the text of this book, you can find it on the Internet Archive, here.) The modern 1970s girl that I was got impatient with the book, and I put it aside and forgot about it. So, my dad, knowing how I love old books and history, sent it to me (very well packaged). I was pleased to have it, despite my previous experience with the text. 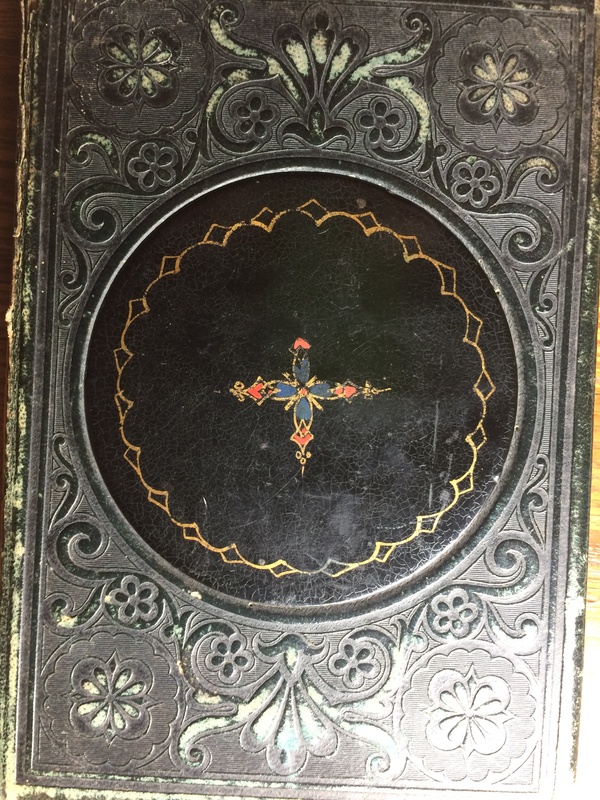 I looked through the book, which has wonderful illustrations in it; the edges of the book are in very faded gold-leaf. This book was not inexpensive back in the day. I wondered if it was a gift. A gentleman’s calling card tucked into the second half of this book. I’m intrigued. I don’t know who the original owner of this book was, but the giver may likely have been W.B. Stone. 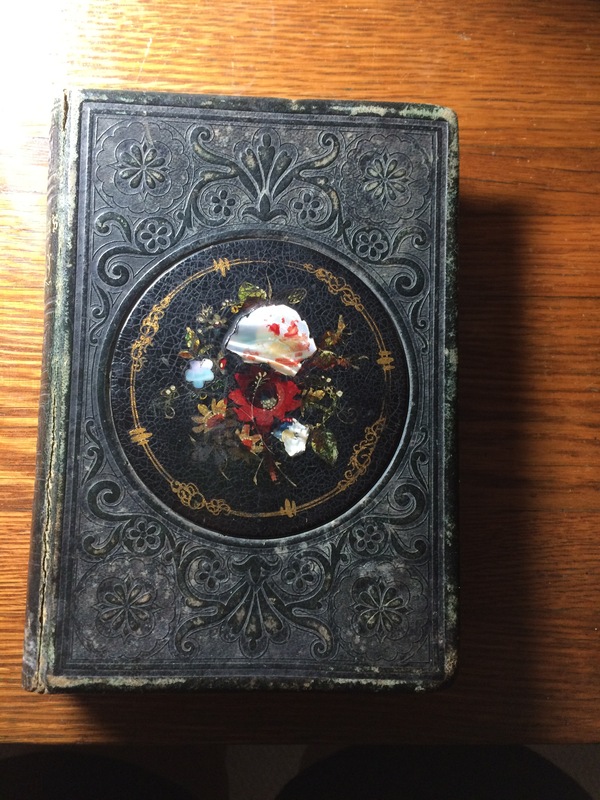 This book, with the expensive gold leaf and mother-of-pearl inlay would definitely have been a nice (and extremely proper) gift to a young lady back in the day. It looks like the back of a playing card. Back in the day, calling cards were an important part of the social ritual. 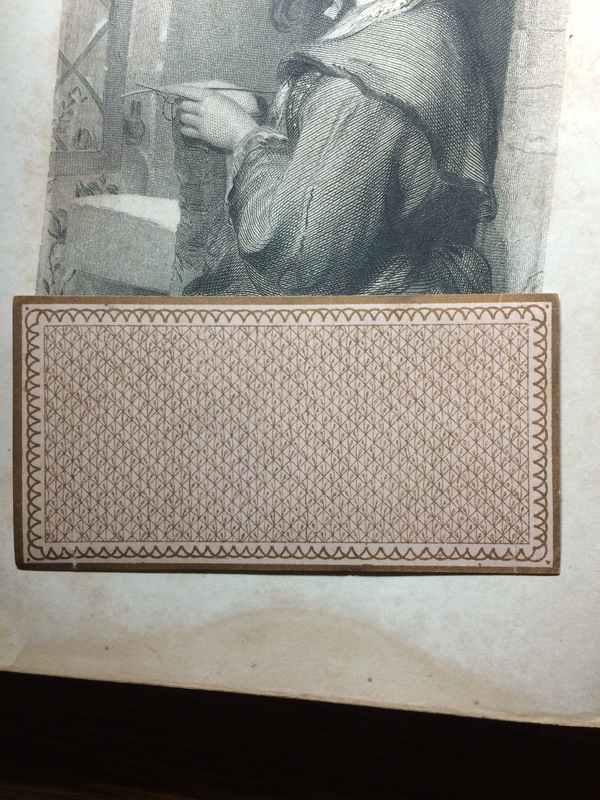 A man’s card was usually simple, like the one seen above. Emmett would have had one like this, too, with just his name. 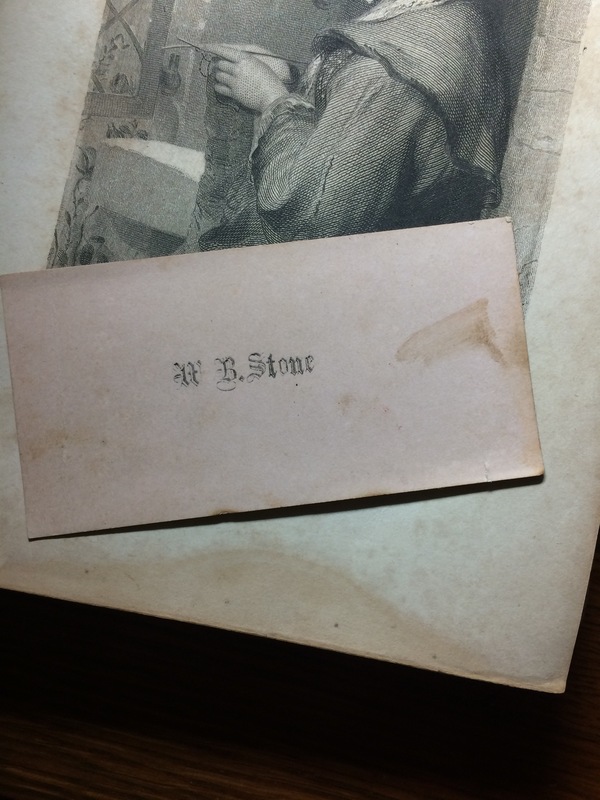 So, for example, Emmett’s personal calling cards would have read, simply: Emmett Wilson. His business calling card might have read: “Hon. Emmett Wilson” with a line such as “Attorney-at-Law” underneath. But a gentleman never made the mistake of leaving the business card at a young lady’s house unless he was making a business call. It was considered bad form to have a professional title on a personal business card. Of course, you know this means I have a new artifact to add to my wish list: Emmett’s business or personal calling card. I hope to come across one somewhere in my research adventures.